In order to make jewelry, you will need the right set of tools. The first thing you'll need is a bench, about 36 inches in height and with sturdy legs. An old table will do the trick, or you can make your own. Your bench should be comfortable when you sit and work at it; your bench should also be large enough to accommodate your work. Basic tools you'll need include a jeweler's saw and blades, flat-nosed and round-nosed pliers, wire cutters, and needle files. You will also require a small bench vise plus a hammer, a mallet, and a mandrel. 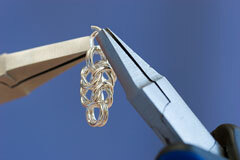 Round-nosed pliers are useful for making bends, curves, and loops in wire. Look for pliers with a spring to help you control the tension on the wire. Flat-nosed pliers are good for holding, straightening, and flattening wire and for making angular bends. Again, look for spring-loaded pliers. Mandrels are tapered spindles on which rings and bracelets are hammered into the desired size and shape. In addition to these tools, you may want to buy an adjustable lamp so that you have good lighting while you work on your jewelry. As your jewelry making skills progress, you'll need some more specialized tools. Riffler files allow you to file corners, while wooden punches help with forming work. Ring sizers are necessary for ring making, while a doming block is needed for making domes and semicircles. If you flatten or hammer metal, you'll need an anvil or flat plate, while a crucible enables you to melt scrap and pour it into an ingot mold. Other special purpose tools include top and side cutters, large files, and drawplates. 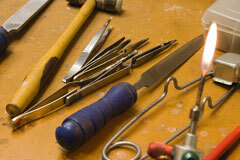 Jewelry making is a diverse craft that requires a varied collection of tools and equipment. Scribes, metal punches, burnishers, suede sticks, jointing tools, and ring clamps are just a few of the other specialized tools used by professional and amateur jewelers. Many different tools are available for providing heat during the jewelry making process. Certain types of jewelry must be soldered at high temperatures, and this soldering activity requires a special area on your workbench. For safe soldering, you'll need a portable or adjustable torch, a heat-resistant mat, and a charcoal block or synthetic soldering block. A good supply of paint brushes, old toothbrushes, empty jars, and heat resistant dishes will also be handy during the soldering process. For more advanced jewelry makers, large equipment includes ultrasonic cleaners, which clean metals; a polisher, which is essential if you want a highly polished finish; and a rolling mill, which reduces the thickness of silver and of sectional and round wire. A flexible shaft machine allows you to drill and texture surfaces, while a kiln is used for enameling, annealing, and casting. A tumbler or polisher is used for finishing fine pieces like chains or rings. This precision tool supplier features an array of tools and related products for jewelry manufacturers, dentists, artists, and hobbyists. This Florida jewelry products company supplies a wide variety of jewelry tools, supplies, and equipment to the jewelry industry. This New Jersey-based firm offers an extensive selection of small tools for hobbyists, jewelers, and craftsmen.